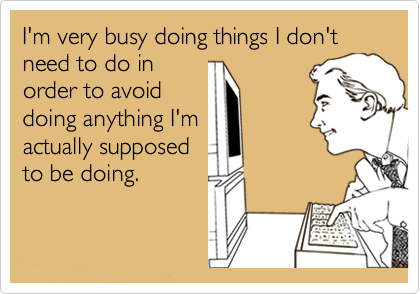 How Do You Procrastinate? - Yes, You CAN Beat Procrastination! Help! I Relate to Several Styles. Am I Hopeless? Attention to Details: The perfectionist pays too much attention to details; the dreamer doesn’t pay enough attention. Focus on the Future: The worrier is overly concerned about what might happen if…; the crisis-maker is not sufficiently concerned (until crunch time). Relationship to Others: The defier goes against what others want; the pleaser is overly oriented to what others want. Your goal is to create a better balance between these extremes! Some believe it’s just plain laziness. Sorry, not true. The crux of procrastination is that it’s an unresolved “approach-avoidance” conflict. Such ambivalence makes it tough to keep you motivated. So, you begin a task but lingering resistance means you work at a snail’s pace. Or, you never move beyond your crippling conflict; your energy remains dammed, damning you to yet another unaccomplished achievement. Yes, everybody does – on occasion. But for some people, it’s a chronic, pervasive and deeply rooted pattern. Chronic procrastinators have a built-in tendency to let things slide, not only with challenging tasks but also with easy ones. Why is Procrastination so Hard to Change? Procrastination is driven by strong emotions and tenacious personality traits. If it were a simple matter, like “making resolutions” or “just doing it,” surely your parent’s nagging, teacher’s scolding or your own desire to be more productive would’ve cured you of it years go. To change an embedded habit, you must learn specific skills and strategies tailored to your personality style. This is essential as the right advice for one style is the wrong advice for another. All Very Interesting. So What Do I Do Now? If you are tired with having one long disconnect between what you intend to do and what you actually do, here are two ways for you to change the pattern. 1. I’ve written a book that will teach you how to change your pattern. How to Beat Procrastination in the Digital Age: 6 Change Programs for 6 Personality Styles is available in print and digital form. First you’ll take a 60 question quiz to pinpoint your personality style(s). Then you’ll delve into the chapters that describe, in detail, your personality style. You’ll discover illuminating insights that will clear up any confusion you have about why you operate the way you do. Then you’ll immerse yourself in the change program tailor-made for your personality style. There you’ll find empowering strategies, creative guided imagery, innovative to-do assignments and more. To buy the book now, click here. The print book can be personally autographed, which makes it a great gift for yourself or a loved one. 2. Learn how coaching sessions can help you achieve your goals. We’ll work together to define the problem, enhance your skills, create a game plan, define a timeline and provide you with a tailwind to help you achieve your goals in a timely way. For more information about coaching services, click here. 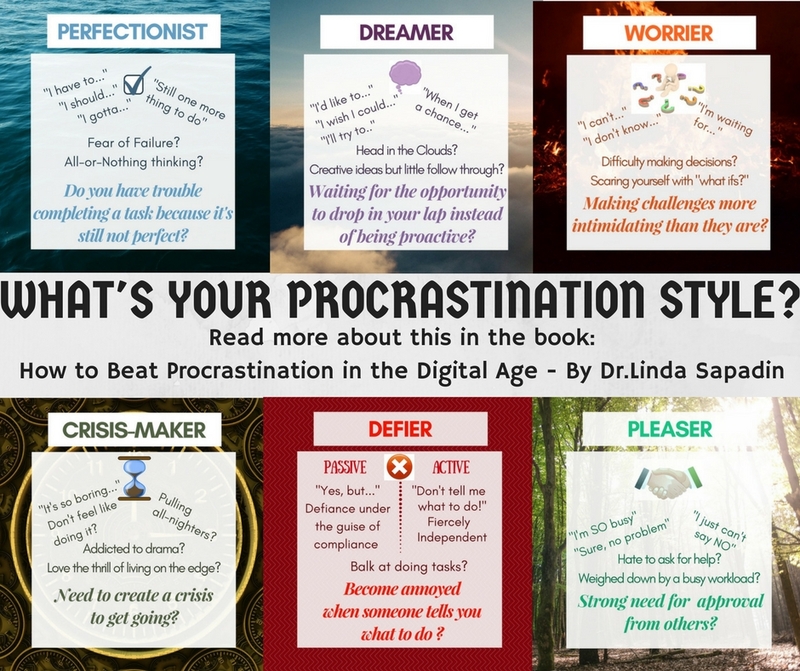 Click here to buy the book, How to Beat Procrastination in the Digital Age. Learn how COACHING can help you reach your goals! Click here for more info.